Dalí Atomicus, 1948. Photo: Philippe Halsman. Salvador Domingo Felipe Jacinto Dalí i Domènech, 1st Marqués de Dalí de Pubol (1904–1989), known as Salvador Dalí was a Catalan surrealist painter. 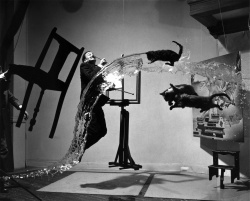 Dalí's artistic repertoire included film, sculpture, and photography, in collaboration with a range of artists in a variety of media. His best-known work, The Persistence of Memory, was completed in August 1931.